Democratic presidential candidate calls for balanced American Middle East policy, deems Israel's actions in Gaza "disproportionate." 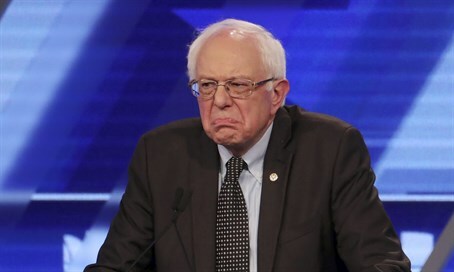 Democratic presidential candidate Bernie Sanders on Sunday called for a more "balanced" American Middle East policy, deeming Israel's actions in the 2014 Gaza war "disproportionate." "The only way we succeed (in the Middle East) is that if the United States plays the role which is of course we are going to support Israel, but you cannot ignore the needs of the Palestinian people," Sanders told CNN in an interview. Dismissing the relevance of his Jewish background, Sanders replied, "I would hope that every person in this country wants to see the misery of never-ending war and conflict ended in the Middle East." The comments come days after Sanders sparked a firestorm when he claimed Israel killed 10,000 Palestinian Arabs during the 2014 Operation Protective Edge in an interview with the New York Daily News. “I don’t have it in my number … but I think it’s over 10,000. My understanding is that a whole lot of apartment houses were leveled. Hospitals, I think, were bombed. So yeah, I do believe and I don’t think I’m alone in believing Israel’s force was more indiscriminate than it should have been,” he said. Sanders was off on the number, however, as nearly 2,300 Palestinian Arabs were killed and another 10,000 wounded. The comments elicited criticism from the Anti-Defamation League, who called on Sanders to publicly correct his statement. “The idea that Sen. Sanders stated definitely that 10,000 Palestinians were killed is just not accurate and a distortion of that discussion,” Sanders spokesman Michael Briggs said. Asked Sunday about the comments by CNN, he repeated that Israel's actions were "disproportionate." "Israel has 100 percent -- and no one will fight for that principle more strongly than I will -- has the right to live in freedom independently and in security without having to be subjected to terrorist attacks," he said. "But I think that we will not succeed to ever bring peace into that region unless we also treat the Palestinians with dignity and respect." "In Gaza right now, poverty, unemployment, their community has been decimated," Sanders continued. "You can't ignore that fact." "And you can't just be only concerned about Israel's needs." he added. "You have to be concerned about the needs of all other people in the region."